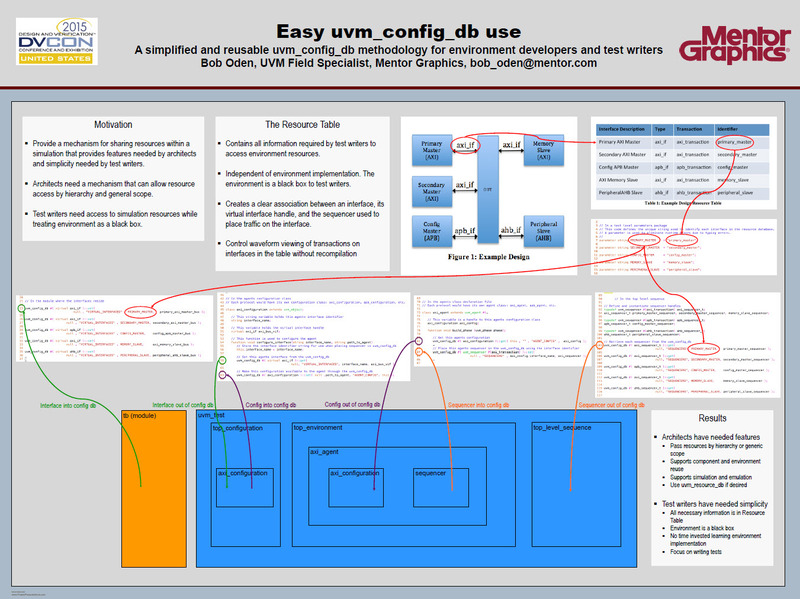 UVM Framework is a combination of a class library and a code generator, delivered as part of the Questa® Verification Solution, that enables you to build a UVM testbench within an hour. Providing an architecture and reuse methodology, it allows verification teams, whether they are experienced or new to UVM, to assemble operational UVM testbenches, including industry-standard Questa VIP components, freeing the team to focus on verifying product features. The UVM testbenches developed with UVM Framework are also compatible with our Veloce® emulator. In this session, you are introduced to the UVM Framework and the list of sessions that comprise this video course. In this session, you will learn what the UVM Framework is, the functionality it provides, its testbench architecture, and available documentation and support. In this session, you will learn why code generation can be a powerful tool and how to take advantage of it for the purposes of quickly producing a UVMF-based testbench. In this session, you will learn about components within a protocol agent and its associated bus functional models and the roles and responsibilities of these components including the abstraction level they operate at. In this session, you will learn the steps needed to produce code for an UVMF Interface using the generator. In this session, you will learn the roles and responsibilities of an environment within a simulation. In this session, you will learn the roles and responsibilities of scoreboards and predictors within the UVMF, the scoreboards provided by UVMF and how they are configured. In this session, you will learn how to integrate Questa® Verification IP within your UVMF testbench. In this session, you will learn the format and content of the YAML configuration file that describe the UVMF Environment and what parts of the generated output that you'll need to modify afterwards. The UVMF testbench contains top level modules, top level sequence, top level environment, and top level configuration. In this session, you will learn about the architecture of a UVMF testbench and directory structure. In this session, you will learn the format and content of the YAML configuration file that describe the UVMF Bench and what parts of the generated output that you’ll need to modify afterwards. In this session, you will learn how to compile and instantiate a Verilog and VHDL DUT within a UVMF testbench. In this session, you will learn how to add sequences and test cases to a UVMF testbench using the example derived test and extended top level virtual sequence. In this session, you will learn the roles and responsibilities of the sequence categories and that sequences within UVMF are divided into three categories: interface, environment, and testbench. The UVMF works out of the box with both simulators and emulators, but how? This session helps you to understand Testbench Acceleration and how the UVMF gets you there. In this session, you will learn how to run individual UVMF simulations in both batch and debug mode as well as how to configure and run a regression test suite using the Questa® Verification Run Manager. This session will discuss the new version of UVM coming from the IEEE, the changes and how they'll impact current UVM users. We'll also fill you in on the latest happenings in the UVM committee and introduce you to the UVM Framework. With larger and more complex designs the gap between design and verification has grown larger. Because of this the reuse of the testbench both in new projects and within the same project has become very desirable. One of the "promises" of UVM is achieving such reuse. However, in reality, UVM reuse has been limited. 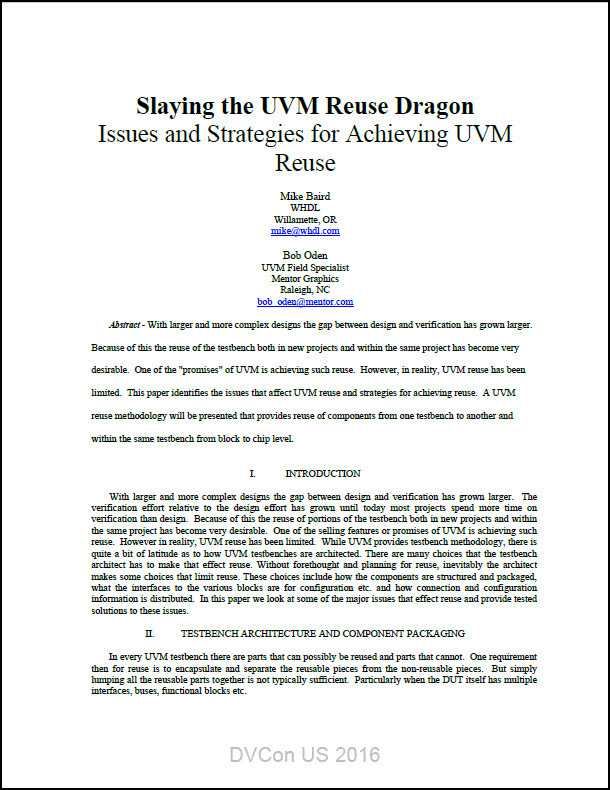 This paper identifies the issues that affect UVM reuse and strategies for achieving reuse. A UVM reuse methodology will be presented that provides reuse of components from one testbench to another and within the same testbench from block to chip level. Provide a mechanism for sharing resources within a simulation that provides features needed by architects and simplicity needed by test writers. Architects need a mechanism that can allow resource access by hierarchy and general scope. Test writers need access to simulation resources while treating environment as a black box.